The minaret of the X – XI centuries is located in 12 kilometers southwest of Tokmoka, on the road to the picturesque gorge Kegety of the Kyrgyz range. This monumental, religious construction dates from the period of the Karakhanid tribes, which owned the largest part of Central Asia 900 years ago. It is built from the fired breaks and juniper beams. The terete, narrowing upwards trunk, which is belted of ornamental brickwork, states on the octagonal stone socle. On the south side at a height of 5 meters the doorway is located, from which the spiral staircase leading to the observation deck begins. The tower height is 21 meters, diameter - 9 meters. Its previous height was probably 44- 48 meters. On the territory, which surrounds the tower, as a result of excavations, the remains of three mausoleums and dilapidated living spaces of the XI – XII centuries were discovered. Probably, Burana Tower was the vertical dominant of the ancient city Balasagun, the north capital of the Turkic lingual state of the Karakhanids. In 1218 Balasagun was captured and destroyed by the Mongols and Tatars and stopped its existence in the XIV century. In 1976 the Burana settlement was declared the state reserve, the restoration of the tower was held and the republican archeological and architectural museum was opened in 1977. 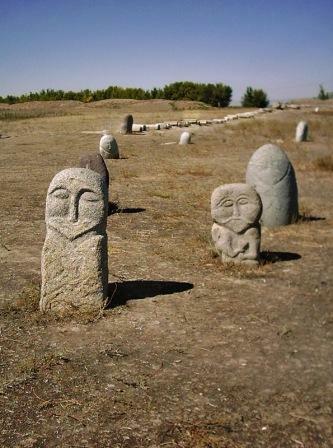 The base of the museum is Burana Tower, balbals – stone idols (VI – X c.), stones with petroglyphs (1 millennium BC.) and the museum itself with different archeological exhibits.